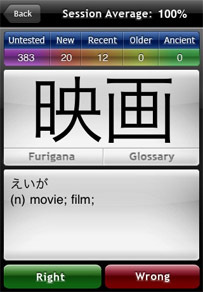 Japanese Flip is a learning tool similar to flash cards, but with an intelligent progress tracking system that helps you learn faster. It is available for the iPhone and iPod Touch. The program remembers which Japanese words you have trouble with, and which you have learned well. It focuses on the problematic items, while using longer spans of time between repetitions of learned material.